Why use EdBook to manage your property? As the housing market changed and properties lay empty with no buyers in sight we saw an opportunity in this very popular holiday let market. We have managed to keep the same owners and properties from the very start and 4 years on we have continued to see many changes. In the beginning our clientele range started from owners not being able to sell their homes and so they would go down a short assured tenancy route which has some disadvantages if you want to sell or if you want your property to continue to be well maintained. The holiday let solution seemed to be the answer as Owners/Landlords were delighted to gain an income whilst their properties lay empty waiting on a buyer and the market to turn. Some of my clients' even took their properties off the market as they are more than happy with the income the property is generating. We even had a guest who stayed in my very first listing and loved the apartment so much that she bought it... this was a duplex in Merchiston on two floors with clear views of Edinburgh Castle. A popular property for larger groups as it could sleep eight. These properties work well in Edinburgh and are in great demand. Holiday makers are delighted as they get the chance to stay in Edinburgh for a week-end or longer with the flexibility and affordability that comes with staying in a home from home rather than a faceless hotel. We are happy to work with you to get the best out of renting your apartment short term from 2 days to 30 days in one go. You may just want to list with us for the Festival. This is fine but please call us early so that we can give you the best advise to see if you have the holiday let potential required for our guests. If you want advise on trying to buy a holiday let then call us - we may know someone who is selling. And of course once you have bought it we are here for you managing it all the way. If you want to know how much income you are expected to gain then call. We will even help you get started with the initial costings in laying out everything. We are currently looking for new properties so that we can continue to direct our guests to more choice and get mass bookings for all our owners. We love properties in the town centre as they book well. However, we have built this business up by not refusing to look at any property or any location. Don't be put off. Let me direct you. 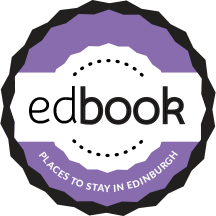 Edbook provides owners/landlords a great way to make money throughout the year, or even for short periods. If you want a Free visit to your property, whether it be to sell, advice for holiday let potential and expected income or both. Just call 07960 341 431 and ask for Evelyn.